Every room has a water view. After the better part of two weeks spent in a house undergoing some loud and odorous renovations, the idea of a relaxing water view, albeit close to home, called to me. And called to me very loudly. That’s how we decided to stay at the Silver Cloud Inn Tacoma Waterfront. 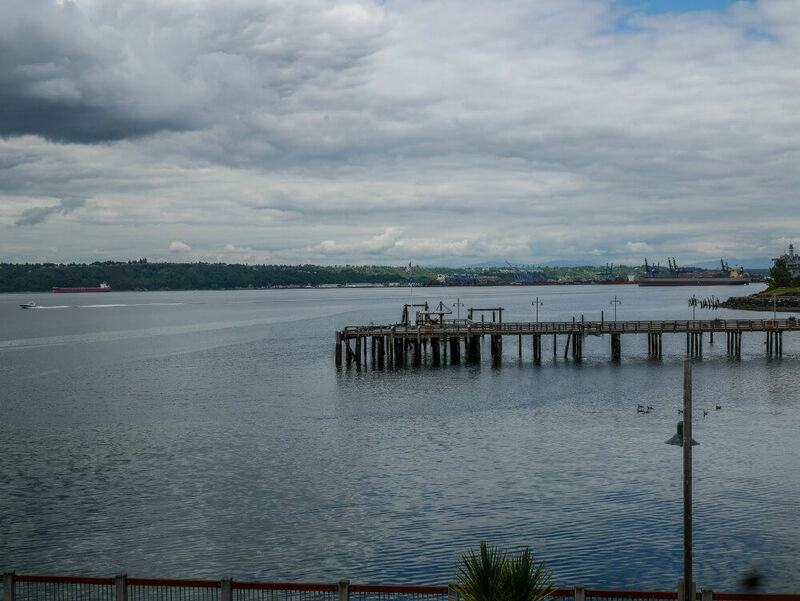 Located on Ruston Way in Tacoma’s Old Town neighborhood, the 90-room Silver Cloud is the only waterfront hotel in the city. 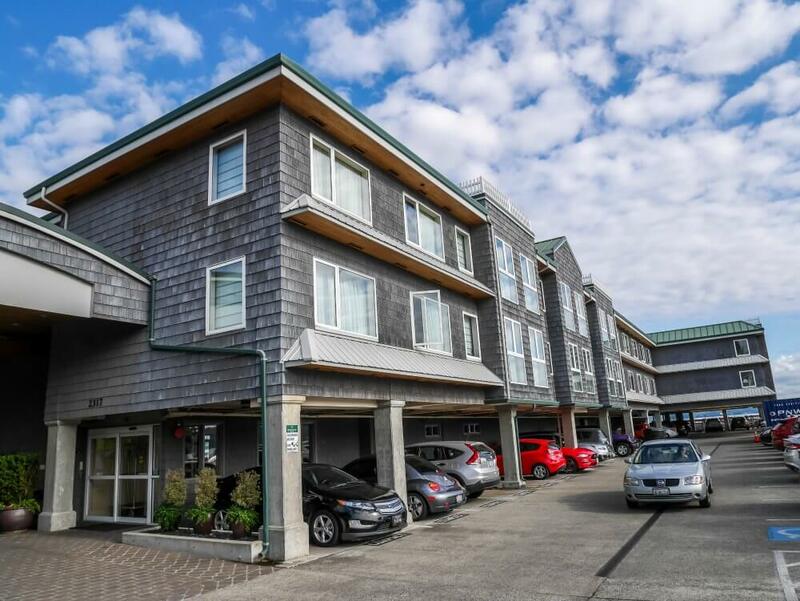 It’s just a couple of miles away from the central business district, and is an easy drive – unless it’s a sunny day – the traffic to the waterfront can get crazy during those times. The hotel lobby is bright and airy, they’ve taken advantage of their water view with big windows in the lobby and the adjacent living room area. The living room is a great spot to relax and enjoy a cup of coffee, there’s a pot at the ready, and in the morning it serves as the dining area for the complimentary breakfast. The front desk staff was excited that as locals we chose to stay there. Instead of exchanging basic information, she switched gears to let us know about new things happening along the waterfront and suggested things that we may have missed on previous visits. It almost felt like dishing with a pal about what to do that weekend instead of a sterile business transaction. A great first impression. Before my stay, my opinion of the Silver Cloud chain was that it was barely more than a motor inn. I was wrong (as I was in a previous chain hotel stay). Note to self: Stop being a hotel snob. Our entry level room was large and bright, with a full water view (instead of the postage stamp sized view I was expecting). 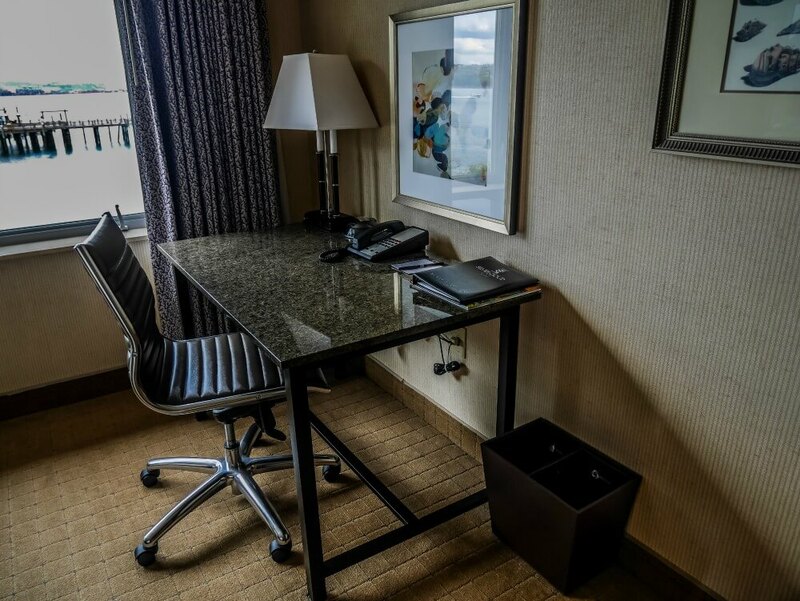 The room had a high-definition television, complimentary wifi, a good-sized desk and workspace, Aveda bath products, refrigerators, and microwaves – everything we needed for our literal home away from home while the remodel was finishing up. 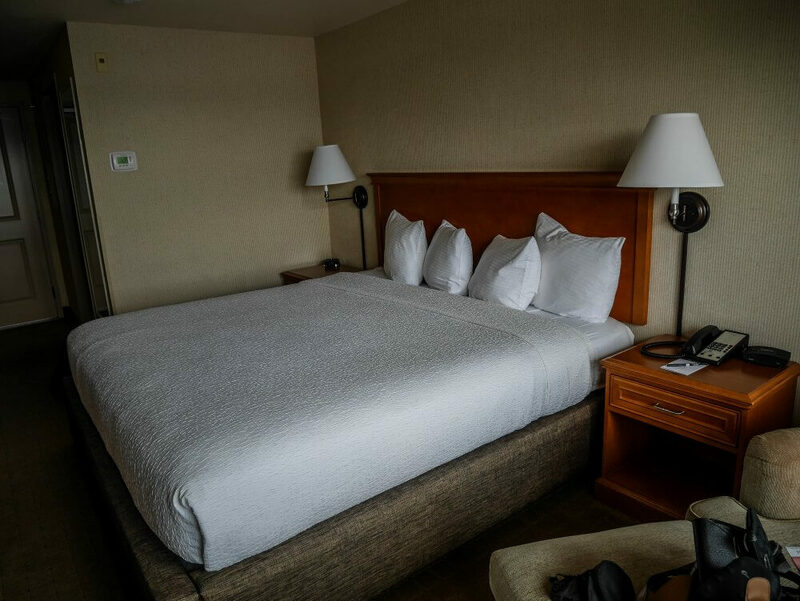 Upgraded rooms come with fireplaces, practical in the winter and a mood setter all year long. Suites have private balconies and whirlpool tubs. And all the rooms really do have a water view. A business center and workout room are also available. Laundry facilities are also available. When the weather is warm, you can enjoy the outdoor picnic area. Parking is free as is the free local area shuttle (it’s nice to tip the driver, though). I recommend parking the car and walking or using the shuttle for places nearby. We chose to walk along the Ruston Way waterfront, enjoying the weather and the view and had lunch at one of the restaurants at Point Ruston. There are several restaurants, a multiplex theater, and some boutique shops. We ate at Wild Fin and highly recommend the garlic shrimp appetizer. 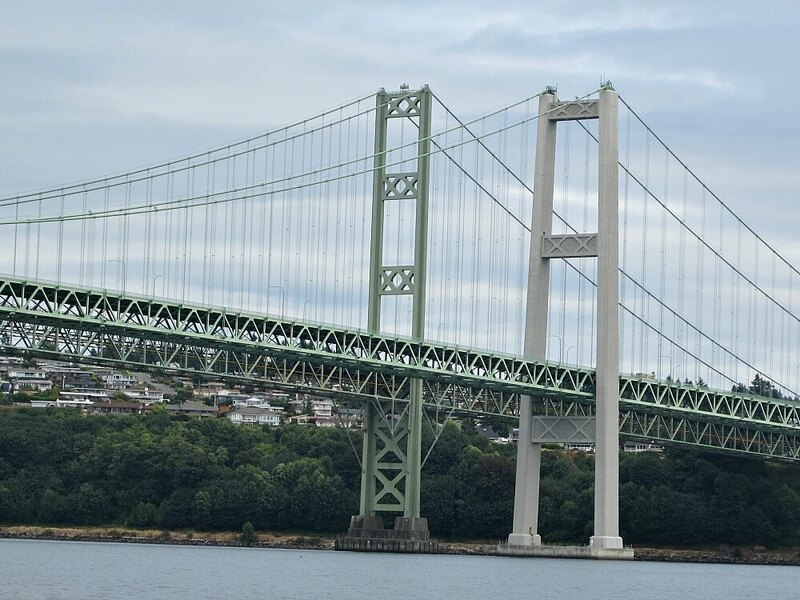 It’s a healthy walk from the hotel to Point Ruston, so if you’re not up for it, the shuttle will take you anywhere along the waterfront or into downtown. Breakfast was served in the living room adjacent to the lobby. In addition to the usual continental breakfast type of things, there were also waffles and eggs. Seating was sparse when we went down at 8 a.m., that’s prime time for breakfast, but the tables turned over quickly. The Silver Cloud Tacoma Waterfront is located at 2317 Ruston Way, Tacoma, Washington. Rates start around $150 per night. 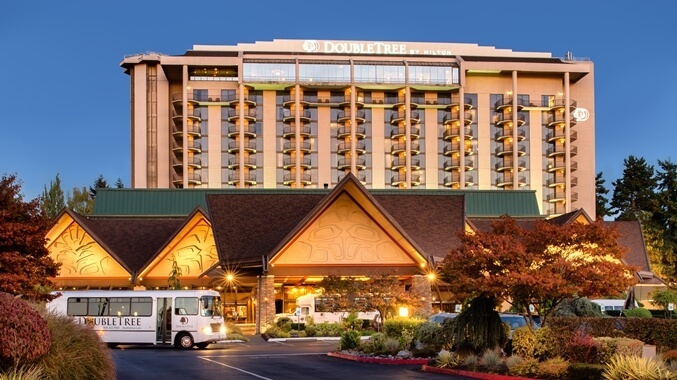 Given the locations and the amenities included, we considered this a great value. NOTE: The Silver Cloud Tacoma Waterfront offers prime viewing for the July 4th fireworks over Commencement Bay. The hotel books up fast for this holiday period and all holiday bookings must be made directly with the hotel. At other times you can book through Priceline. 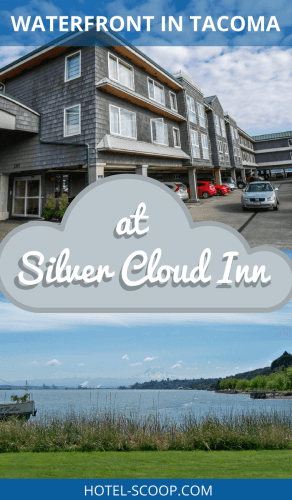 Rumor has it that a second Silver Cloud Inn will be opening at Point Ruston, the other end of Tacoma’s waterfront, sometime next year. We’ll be checking out its progress and will plan to stay at it when it opens.